So near, yet so far. An afternoon of highs and lows at Stark’s park in a pulsating 3-3 draw finished with Rangers needing to beat Dumbarton on Tuesday night to secure a return to the top flight. Raith would take a shock lead in the 25th minute as Louis Longridge fired a long-range effort beyond Foderingham – if he hit that shot another 100 times, 99 would have ended in the stand. Rangers pressed for the leveller Harry Forrester would be denied by a superb Kevin Cuthbert save, but moments later Forrester would be celebrating; he found the net with a superb angled header. He would then turn from scorer to provider as he set up Michael O’Halloran to score his second goal in two games. Rangers would only go in level at the break – Wes Foderigham made a mess of James Craigen‘s powderpuff shot and it squirmed under the body of the keeper. Rangers would retake the lead four minutes after the break. Andy Halliday would do some magnificent work in midfield, find Kenny Miller, and the striker found the net with a superb first-time finish. But there was two final twists. Raith got awarded a penalty late on. Harry Panayiotou appeared to go down too easily in the area when Rob Kiernan went to challenge him, but justice was served when Wes Foderingham stopped his penalty. However, with the last kick of the ball, the on-loan Leicester man would make sure Rangers’ promotion celebrations were put on hold as he scored from close range in the aftermath of a goalmouth scramble. One goal, one assist and a terrific all-action display from the former Donny man. He is getting better and better. Foderingham shared his frustrations: “It’s very frustrating to have conceded nine goals in the last three games, especially a side like us who has showed defensive promise. “We’ve been fantastic at the back throughout the majority of the season in terms of our defensive record and over the last three games we’ve conceded too many goals. “It wouldn’t have been that way [celebrating on the pitch], the fans were magnificent but we have a big game on Tuesday night at a sold-out Ibrox and then we have another big game at the weekend and a massive one the following – they just keep coming. “I thought we dominated and deserved to be ahead but the penalty was given, Rob is adamant he never touched him; I haven’t seen a replay yet. Louis Longridge’s goal was the 9th time Rangers have conceded the opening goal this season. The final goal of the game. It was a defensive mess and postponed Rangers’ promotion party. All three goals were very well-taken, but at times the decision-making could have been better in the final third. 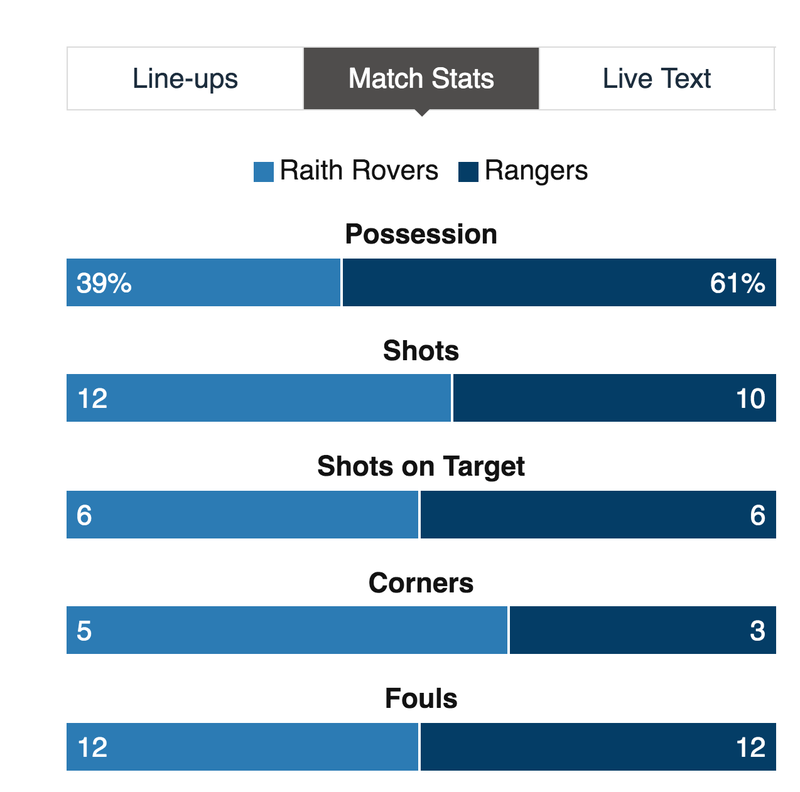 Too often Rangers went to shoot when the pass was on or passed when the shot was on. That will improve as the players mature and develop. Andy Halliday was unlucky not to win man of the match. He was superb: his assist for Miller’s goal was quality, grit and determination all rolled into one. He also made a superb last-ditch tackle in the second half that stopped a clear shot at goal for Raith. When Rangers go in front, they are getting into the terrible habit of switching off. It happened vs QotS and it happened again in this match. They need to maintain focus and concentration for the full 90 mins. The team were a bit over-eager to get the job done and went with a gung-ho approach. It’s strange how they managed to concede nine goals in the last three matches. They have to get back to defending as a solid unit and that will give them the platform to attack and see games out. We don't do things the simple way. Disappointing to draw on Saturday but at least we have the consolation of being able to secure the title tomorrow night at Ibrox. What a 2nd half Andy Halliday is having. 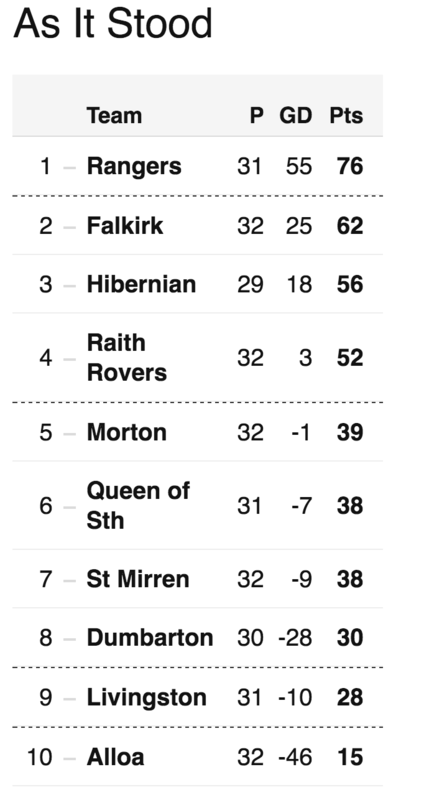 Dumbarton on Tuesday – and a win clinches a return to the top flight.